“Pray” and “Dust” carry on the video’s aesthetic. 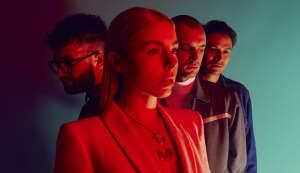 HÆLOS are a trio of Londoners with a penchant for moody trip-hop and a keen eye for visuals. The band released an intricate four track EP titled Earth Not Above earlier this summer and have since, expressed plans to turn the record into a film. Back in August we premiered the first act, "Earth Not Above" which was shot entirely in one take. Today, the band returns with acts 2 and 3. "Pray," a new song from the group, gets a heartbreaking visual in act II matched only by the track's brooding energy. All three acts are streaming over at the band's website, and you can watch "Pray" above.